What does a massive North Carolina industrial complex that can churn out $1 billion worth of steel a year have in common with a processor of sweet potato-based food filler located 90 miles away? Both manufacturing operations ‒ Nucor Corp.’s steel plant in Hertford County and the Carolina Innovative Food Ingredients facility in Nash County ‒ could benefit from the leveling or lowering of energy costs promised by the proposed 600-mile Atlantic Coast Pipeline, which last month passed a key regulatory milestone. In July, the Federal Energy Regulatory Commission (FERC) issued its final environmental impact assessment of the pipeline, which would carry natural gas across West Virginia, Virginia and North Carolina. The assessment concludes that while the pipeline would have some adverse environmental effects, most could be reduced to insignificant levels. Writer Edward Martin’s article in the 2017 North Carolina Economic Development Guide, published by Business North Carolina, takes a closer look at the possible economic impact of the pipeline project. 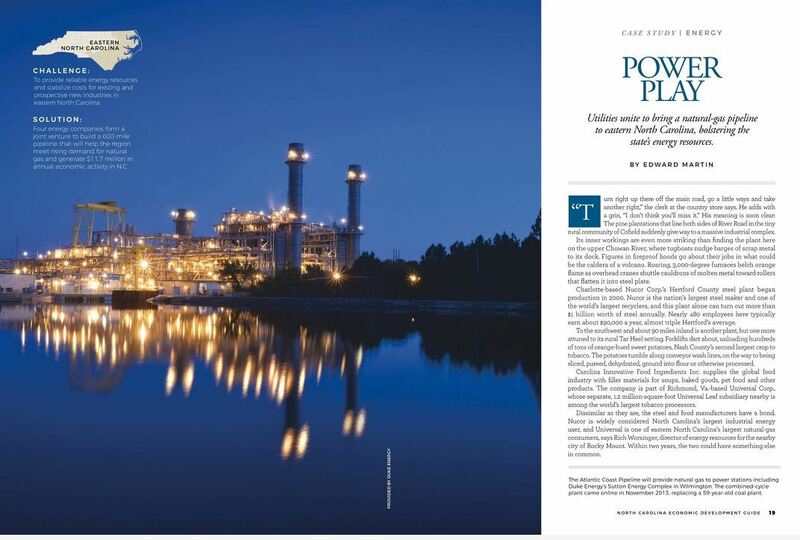 The article opens with the illustration of the Nucor and Carolina Innovative Food Ingredients plants. Many business and political leaders support the pipeline, while many environmentalists and landowners affected by the project oppose it. Pipeline developers say the recent FERC assessment puts the project on track for final approval later this year. But opponents insist remaining legal challenges and permitting requirements mean it’s not a done deal. In the article published before FERC released its final assessment, Gary Brown, director of the Northampton County Economic Development Commission, says that without the new pipeline, it’s uncertain if the region could land another Nucor. The steel plant employs nearly 480 people who earn $90,000 a year on average, almost three times the Hertford County average, the article says. Such sentiments are echoed by other Eastern North Carolina industry recruiters interviewed for the article. They include John Chaffee, president of the NCEast Alliance, a private nonprofit economic development organization representing more than two-dozen North Carolina counties. Access the full article here. You can also download the 2017 North Carolina Economic Development Guide to read this and other timely case studies, as well as listings of economic development resources and assets in every region of the state.